Sharian sells Oriental rugs from a variety of places in the Middle East and Asia. Iran - The Persian empire was where rug-making reached its peak in the 16th century, and many traditional patterns and weaving techniques are still practiced there. Persian rugs are usually named after the town, district or tribal area where they are produced, and include the classic Kerman, Sarouk, Tabriz and Heriz. China - Traditional Chinese rugs are recognizable by their simple, classic motifs and unusual colors. They are usually framed with a simple, wide border, and are sometimes sculpted to enhance the definition of the pattern. China also produces rugs with Persian, French Aubusson and Savonnerie and Art Deco designs. India - In recent years, India has become one of the leading centers of Oriental rug production. India produces rugs in a wide range of colors, sizes and designs. Turkestan / Caucasus - Turkestan is notable for its production of the ancient Bokhara patterns. Rugs from the Caucasus Mountains typically have bright colors and strong geometric patterns, which sometimes feature both animal and human figures. 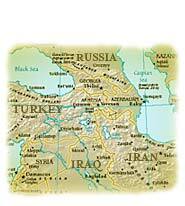 Turkey - Turkey, once a center of rug weaving, suffered a decline in rug production after World War I. For this reason, many of the available rugs from Turkey fall into the antique and semi-antique categories and are prized for their designs and colors. Modern rug production is increasing, especially in the area of antique reproductions. Tibet & Nepal - Rugs from Tibet and Nepal are very popular, and are known for their contemporary abstract designs and wide color palette.